Still new to the world of Ham but still I'm looking into the future. What type of License and Rig(cost wise) would I need to broadcast out of state? The more coverage the better but the minimum I would like to eventually do is hit the next state over. It depends on the distance and terain, natural and man made obsticles will interfear with your coms. 2 meter (VHF), 70cm (UHF), C.B. are all line of sight transmision. So take a look at google earth to see what objects may bolck your path. Then look a map that does line of sight distance or how the crow flies distance. Also your transmision elvation has to be added in to this, are you in a valley, hill top, or flat land. Prices depend on what you need you can spend as little as $100.00 up to your limit. There are cheaper radios, but you also have to include a antenna, that is what my price is based on. Joe's correct, Pavelow; it's all a function of the distance you want to get to. Remember too that you don't need to get there directly. In my case, for example, I can get my message traffic (this month there will be close to a thousand messages) to any State I want by use of the existing amateur radio networks that are available to you for free. A few minutes ago, I had a message that came to me from Germany. It was destined for Anchorage AK (I'm in Nebraska), so I relayed it on to a station that is known (to me) to be reliable and error-free. His automated network node will relay the message on to the Pacific Area and then into Alaska for delivery. My antenna is made of a hunk (a very LONG hunk, true, but still just a hunk) of wire. Cheap. We're here to help you get set up so that you can realize your goals. Just ask. Good deal. I was a little worried I'd have to spend a couple grand to do what I wanted to do when the SHTF. Ill just focus on the licenses for now. Appreciate the help. This is an awesome forum. Figure on getting the General class license for sure. Technician gives you access to the VHF/UHF bands but these are line of sight unless repeated. The General class adds the HF (High Frequency - shortwave) bands which can be used to contact other stations around the world. It isn't a difficult test and can be taken the same time you pass the Technician test. Wow, I really like that one! I think I'll write that on the wall. Figure on getting the General class license for sure. I don't know how it is elsewhere but, because so much of the Tech is applicable and regurgitated on the General, it makes sense to take them both. The "elsewhere" part is that, around here, if a person came into the room and the (usually very old/experienced) Volunteer Examiners had someone pass the Tech and then refuse the free try at the General they might look for a hangin' tree. I don't know how it is elsewhere but, because so much of the Tech is applicable and regurgitated on the General, it makes sense to take them both. Same from General to Extra. You can actually get the three books and read the same chapters (chapter numbers vary) from the three books each day and attempt the three exams after a couple weeks studying. That's what I did.. For Tech an General, it's easy, you might as well. Extra requires a bit more work. I highly recommend doing many practice exams on QRZ.com. I am making my initial shop order with the 817nd, and I have chosen the triband vertical from QRP guys as my first antenna. Also their Z Match tuner for QRP, to give it a try with a wire. I am wondering why they use BNC connectors on all of their products? Aint those UHF connectors better? And a maybe a silly question, do I need a unun when using this Z match tuner with a long wire? I assume the longwire is not the same as an endfed dipole because I need a counterpoise, hence it's unbalanced-unbalanced... Right? I decided to go with the RG58C/U cable as a feedline in portable ops... Good choice? I am wondering why they use BNC connectors on all of their products? Aint those UHF connectors better? You would use a 9:1 UNUN with a "random" wire, which is any wire length not close to a half-wave on any band you want to use. With a half-wave wire, you would use either a 49:1 transformer or an HWEF tuner. The Z-match tuner might be able to match a random wire but you have a better chance of finding a match with a UNUN to lower impedance. The random wire is unbalanced... Get an adaptor for the back of your 817 and leave it there, forever and ever! Good choice of the QRPGuys Tri-bander. You probably won't need a tuner on 20m and maybe not on 30, probably needed on 40. Yes. You will find however that it is quite big... For lengths beyond 10m, it is a good choice, but again, takes up a lot of space. I use RG-316. It is about the same size as RG-174, which I also use, but stronger, albeit not as flexible. If you really want the best look at LMR-240/UF. Thanks for the info Gil. So I could use that Zmatch tuner with the tribander for optimal swr? So I could use that Zmatch tuner with the tribander for optimal swr? I received the tuner and the antenna. 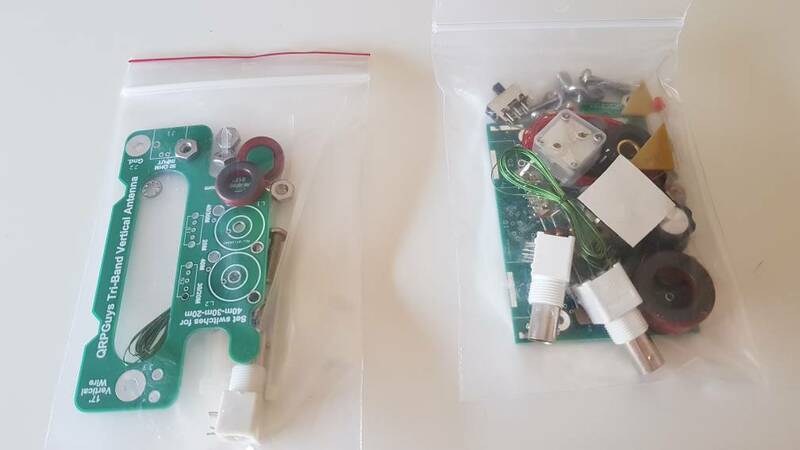 I've never built such kits but I am not new to soldering. We'll see.